Imagine a robot that's better at Where's Waldo than you are, and can find it under 5 seconds? Using Artificial Intelligence, creative agency Redpepper has developed a facial recognition robot capable of identifying and pointing to Waldo. The top speed of the robot is clocked at 4.45 seconds and goes by the name of 'There's Waldo'. The robot tests Google's new AutoML vision which picks up the faces and sends it to the AutoML Vision service, which has been trained on photos of Waldo. 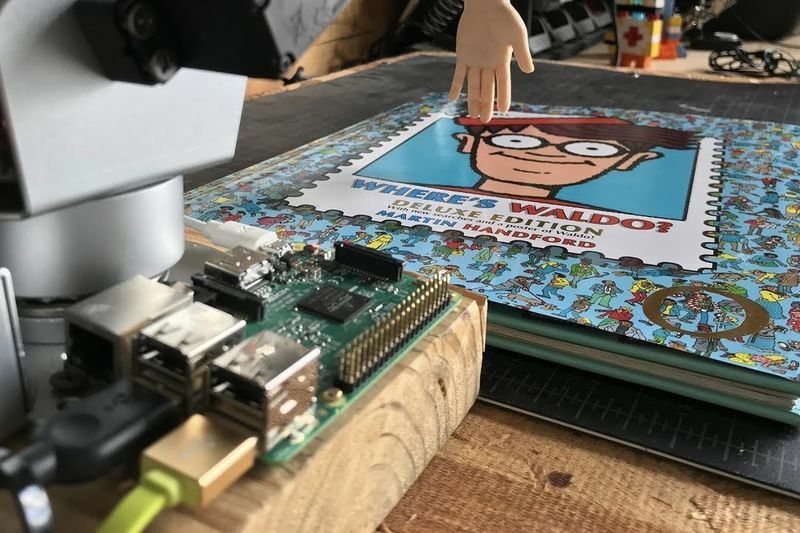 There's Waldo is equipped with an arm that is controlled by a Rasberry Pi-controlled uARM Swift Pro which is equipped with a Vision Camera Kit which allows for facial recognition. Essentially, the arm extends, takes a picture of the canvas below, then uses OpenCV to find and extract faces from the photo. These faces are then sent to the Google AutoML Vision service, which compares each face against the Waldo model it has learned to identify. Matt Reed, the creative technologist at Redpepper who led the project, explained that There’s Waldo built a data model training set of only "62 distinct waldo heads and 45 waldo heads plus body." If the robot has a confidence match of 95% or higher, the arm is instructed to extend and point to the coordinates of the matching face on the canvas. If there are multiple Waldos in a photo it will point at each one. You can catch a glimpse of the process in the video below, in which different photos of Waldo are fed into the software. Have You Seen This Autonomous Weed Killer Robot?